Co-presented with PAJ: A Journal of Performance and Art (MIT Press). John Jesurun, Joe Scanlan, Michael Smith, and Elisabeth Subrin join moderator Paul David Young in conversation. In a startling turn in the visual arts, which once used the word “theater” to describe what art was not, artists and arts institutions and programmers are embracing theater as the vanguard. The 2012 Whitney Biennial is devoting an entire floor to performance and is even putting on a play. The 2011 Performa Biennial featured numerous works of theater. Also in 2011, the Guggenheim Museum presented a play for the first time. Some artists defied the conventional art world animosity toward things labeled “theater” all along. But now performance and the visual arts in general have dropped their animosity toward theater and turned to it as a source of ideas, practices, adaptable texts, points of reference, and philosophy. Rather than focusing on their bodies, their physical presence, and their personal histories, the artists on this panel embrace the fictionalized self. This is a striking move away from the autobiographical, body-oriented, self-directed work of artists such as Chris Burden and many feminist performance artists. What remains of the body-centered aesthetic of earlier performance art? How are repetition and rehearsal incorporated into their artistic practices? How do the dramaturgical concepts of narrative and character manifest themselves in the visual arts context? John Jesurun is a writer/director/media artist based in New York. His presentations mix elements of language, film, architectural space, and media. His work is distinguished by his integrated creation of the text, direction, set, and media design. 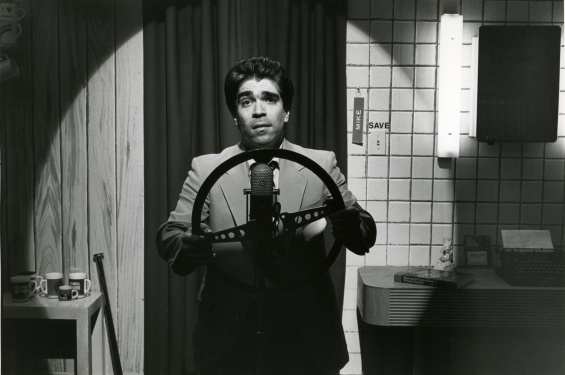 In 1982, he began his serial play Chang in a Void Moon (now in its sixtieth episode) at the Pyramid Club, NYC. Since 1984, he has written, directed, and designed over thirty pieces including: the media trilogy of Deep Sleep (1986 Obie Award), WHITE WATER, and Black Maria, Shatterhand Massacree, Philoktetes, Everything That Rises Must Converge, Faust/How I Rose. His company has toured extensively in Europe and the United States. He is the recipient of numerous fellowships, including those awarded by the National Endowment for the Arts, Asian Cultural Council, MacArthur, Rockefeller, Guggenheim, and the Foundation for Contemporary Performance Arts. His work is published by TCG, Sun & Moon Press, Performing Arts Journal, Yale Magazine, and Theater der Zeit. His latest work, Stopped Bridge Of Dreams, premiered at La Mama in January 2012. The first episode of his new video serial Shadowland can be seen on Vimeo. Joe Scanlan, a New York artist, has mounted more than thirty one-person shows in Vienna, Paris, Amsterdam, London, and New York over the past decade. Among those, he has made exhibitions and publications with the Museum Haus Lange, Krefeld; the Van Abbemuseum, Eindhoven; IKON Gallery, Birmingham; and K21, Düsseldorf. His most recent book, Object Lessons, published by the Kunstmuseum aan Zee, Ostend, and Dexter Sinister, New York, is a case study on how the drive for greater democracy in art often leads to the objectification of its participants. For six years Scanlan was assistant director of the Renaissance Society in Chicago; for eight years he was an associate professor in the School of Art at Yale University. He is currently director of the Visual Arts Program in the Lewis Center for the Arts, Princeton University. Michael Smith is a video/performance/installation artist known for his eponymous performance personae, Mike, a hopeful innocent, and Baby Ikki, a melancholic, pre-lingual, ambiguously aged toddler. In an ongoing series of large-scale narrative projects, Smith has used these characters to comment on discrepancies and absurdities in our culture. Smith has shown his work extensively around the US and Europe at a variety of venues including museums, galleries, theaters, festivals, night clubs, television, children’s parties, and in the streets. Most recently, Ikki appeared in Baby Ikki at the Museum, a picture book co-published by the Whitney Museum and Christine Burgin and distributed by Yale University Press. Michael Smith has received numerous awards including fellowships from the Guggenheim Foundation, the National Endowment for the Arts, the New York Foundation for the Arts, Art Matters, and the Louis Comfort Tiffany Foundation. He is currently a professor in the Department of Art and Art History at the University of Texas at Austin. Elisabeth Subrin creates conceptually driven projects in film, video, photography, and installation. Her work investigates the intersection of history and subjectivity, the nature and poetics of psychological “disorder,” the legacy of feminism, and the impact of recent social and political history on contemporary life and consciousness. She has exhibited widely in group exhibitions and screenings, including the Whitney Biennial, P.S.1’s “Greater New York,” the New York Film Festival, the Guggenheim Museum, the Walker Art Center, Harvard Film Archives, the Mattress Factory, VOLTA, Vienna Arts Week, and the Institute of Contemporary Art, Boston. Solo shows include the Jewish Museum, the Museum of Modern Art, Harvard Film Archives, Sue Scott Gallery, and forthcoming at Participant, Inc. She has received commissions from the MacDowell Colony, the Danish Film Institute, the feminist pop band Le Tigre, and has been a fellow at the Sundance Institute Screenwriting and Feature Filmmaking Labs. She is Assistant Professor of Film and Media Art at Temple University and lives in Brooklyn. Paul David Young won the Kennedy Center’s Paula Vogel Playwriting Award and was a finalist for the Kendeda Fellowship. He has been produced at P.S.1 as part of “Greater New York 2010,” Marlborough Gallery, the Living Theatre, Lion Theatre, Kraine Theater, and the Red Room, and, in Iceland at the Kaffileikhusid in Reykjavik. Currently a writer-in-residence at Lower Manhattan Cultural Council, he was the Kerr Fellow at the Millay Colony, the Pearlman Fellow at Djerassi, and a Fulbright Scholar in Germany. His play In the Summer Pavilion premiered in 2011 to critical acclaim and will be produced at 59E59 Street Theaters, October 8 to November 4, 2012. In 2013, PAJ: A Journal of Performance and Art (MIT Press) will issue his book Turning Theatre into Art, about artists using theater. He moderated the first two newARTtheatre panels, at apexart and Location One. His translation, with Carl Weber, of Heiner Müller’s Anatomy Titus Fall of Rome will be published in 2012. He writes performance criticism for Art in America.